Burning Question: Ellen & Portia’s Serial Home Buying — Is It Epidemic? Yes, Ellen has owned nine homes in the past decade. And nope, some stars are in constant orbit, all right. DeGeneres is known to be sort of an extreme case — someone who has admitted that she loves finding and designing new homes. But so are a lot of other celebrities. In fact, stars tend be into each other’s real estate. “Do you know how heartbroken I was," Jennifer Aniston recently told DeGeneres on the comedian’s talk show, "when you sold that beautiful house to Ryan Seacrest?" She was speaking of a nine-bedroom Beverly Hills mansion, which the "American Idol" host bought last year for $37 million. DeGeneres and de Rossi also once flipped a Malibu home they bought from Brad Pitt circa 2011. Then there's their mountain ranch compound in Hidden Valley, not far from Los Angeles, that, in recent weeks, was both featured in Elle Décor and nearly hit by a wildfire. Their most recent purchase? A $26.5 million Montecito estate so big it has its own name: the Saladino Villa. The six-bedroom 10,500-square-foot home is close to the beach and mountains, and comes with such neighbors as Oprah Winfrey, Carol Burnett, and Tipper Gore. So why do we always seem to be hearing about celebrities moving? Well, let me ask you this: If you could increase the value of your house simply by living in it, wouldn’t you be tempted to sell kinda often? Many homebuyers are willing to pay a premium for a home a star has owned, Salem says. "It depends on whether the homeowner is A-list or B-list," Salem tells me. "But some buyers are pretty aggressive. I have one client who paid a lot of money for this one home — waived inspections, took it as is, it had termites, she didn't care — because it had been a certain star's home." Plus, there's the privacy factor. "A lot of stars will find what they feel is the perfect house, and suddenly, everybody has found out about it, and suddenly it becomes a nightmare for them," financial-planner-to-the-stars Michael Eisenberg explains to me. Hence the rising popularity of double-gated Southern California communities like the Estates at the Oaks, home to Justin Bieber, who moved there just last year. "The paparazzi are never hanging out at the Oaks because they can never get in," says local real estate agent Marc Garbell. "I see celebrities all the time at the gym there and at the park, doing their thing, and no one bothers them." And, finally, there's the obvious. "They can afford to!" notes celebrity tax attorney Bruce Givner, partner at the Los Angeles firm Givner & Kaye. "Ellen can afford to move at her whim, which regular people can't afford to do." To get your Burning Question answered, tweet us @YahooOmg. 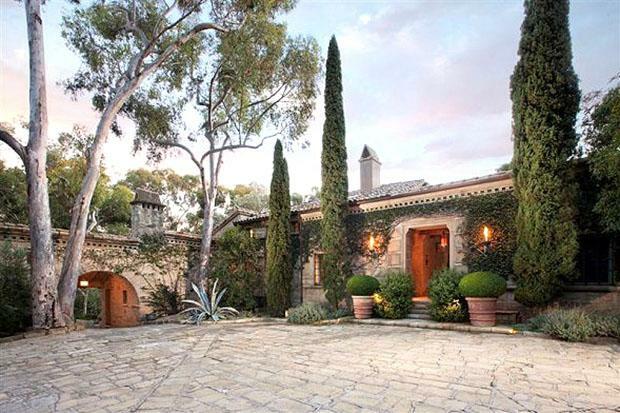 Check out more pictures of Ellen and Portia's new Montecito manse here and on Zillow.